Nothing to download, install, or learn. Simply login and start managing your projects in the cloud. Our construction management software is designed with simplicity in mind. Get up and running in minutes. CM Fusion works on computers, tablets, and smartphones. Access your projects from anywhere, anytime. Manage all your project information in one place, from anywhere. CM Fusion is cloud based construction management software that keeps construction teams better connected and organized. Manage all your project documents in one central location. Capture daily progress and field reports easily from any device. View real-time logs of all your project tasks and activity. Keep everyone on your project up to date with the latest information. Track project time and cost to keep your project within budget. Send automated notifications to reduce email and redundant communication. Manage all your construction submittals with live logs and reporting. Track your RFIs and RFPs with cloud-based precision. Send and manage bid requests for all your jobs. 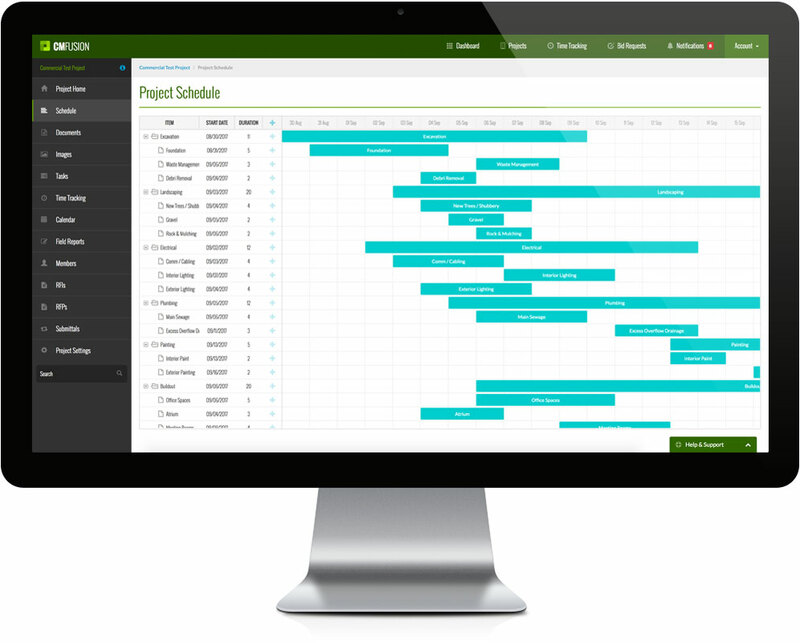 Manage all your project schedule items in one timeline view. Create links and dependencies from one item to the next. Create notes and details for each scheduled item. 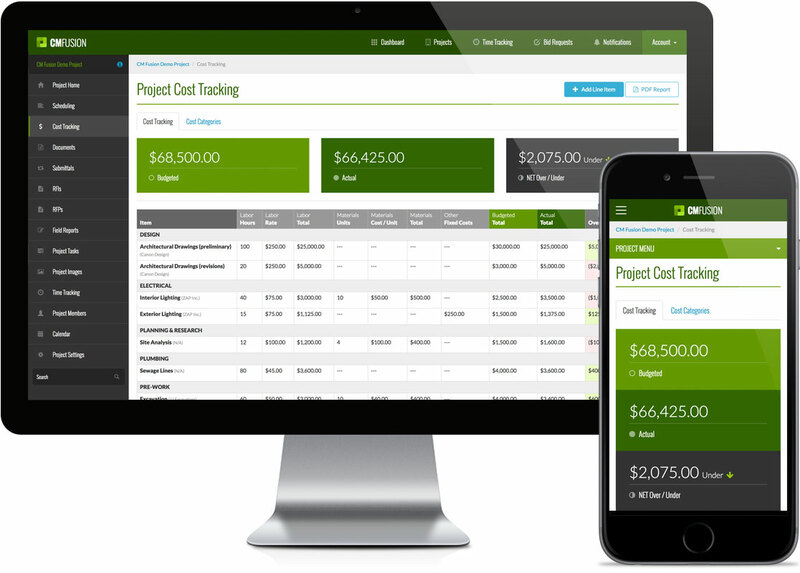 Manage your project budgets with real-time cost tracking. Log daily time sheets for all your team members and projects. Track cost and time your way with custom cost codes and categories. 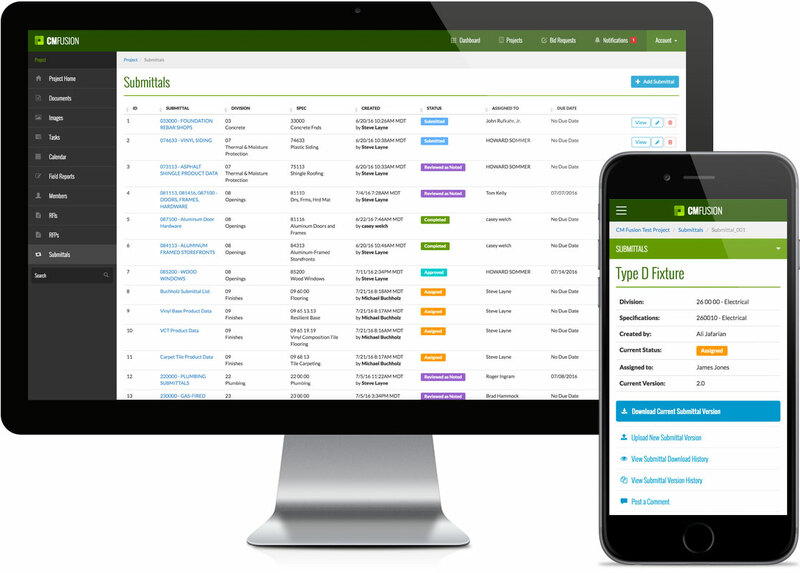 "We use CM Fusion to track all our project activity, from field reports to RFIs. It's given us a central platform for all our project information. CM Fusion is a critical part of our project workflow, which impacts every construction project we do." "CM Fusion has enabled us to move from paper plans to electronic tablets. We can now share information instantly and nothing gets "lost" anymore. CM Fusion provides a venue for easy communication between the field and the office – and every bit of it is tracked within each project. " Construction management software that's fast and ready to scale. CM Fusion grows with your business. Real support from real people. Contact our support team via phone or email whenever you need them. All your project files and data stay protected behind SSL security and backed up to multiple locations.